#1- The "Instant" kind is garbage. It's "Cook & Serve" or nothing. #2- Though delicious, it does NOT belong in a pie crust. Simple, right? And yet, most chocolate pies out there generally surrender to the little store bought boxes of magic mentioned above. 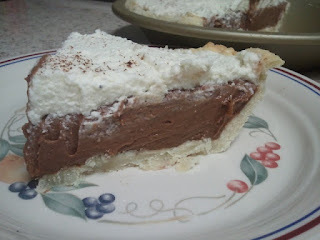 So, I recently took it upon myself to find a really "kickin" chocolate pie recipe that does NOT require JELL-O Pudding (Cook & Serve, or otherwise). What I ended up finding is a rather unconventional recipe, thanks to vanillacarrots.com, that turned out better than almost any other pie I've ever made. It is rich, and creamy, and when you taste it for the first time, you will say something like, "Oh. Ohhhhh!" Mix cornstarch, sugar and salt in a heavy saucepan. Add milk and egg yolks. Whisk until smooth. Cook over medium heat stirring with a whisk until mixture thickens. Turn off the heat and whisk in the chocolate and cream cheese. Add cayenne pepper, ground cinnamon, and vanilla extract. Whisk until blended. Cool completely. In a large mixing bowl, whip the cream until stiff peaks form. Add the vanilla and powdered sugar to the whipped cream. Add 1 cup to the cooled chocolate mixture and whisk to blend. Pour into the pie crust. 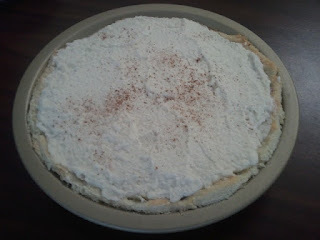 Spread the remaining whipped cream over the top of the pie and sprinkle with cinnamon. Chill six hours. You must try it WITH the cayenne pepper! Part of the pie's decadence is that "bite" that comes towards the end of tasting the chocolate. I promise the cayenne doesn't make your dessert taste like salsa; it just adds a little heat, and that heat somehow makes the chocolate taste better.